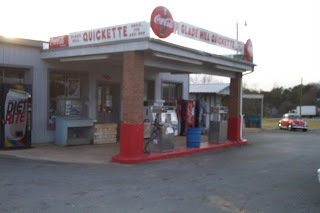 It's been about two weeks since my friend Steve Meador had to close, after fifteen or so years, the Glade Hill Quickette. 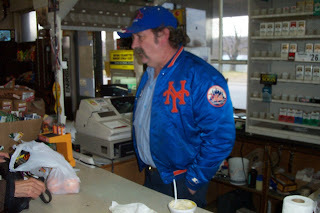 Like many independent "country stores," Steve's was as much social center as retail establishment, the place people went to for the latest news, gossip, jokes, jawboning around the heater in wintertime, on a bench out front in summer. The world's problems may not have been solved there, but they were certainly enumerated, often in hialrious and occasionally obscene detail. I bought my onion sets and seed potatoes from Steve for well over a decade, and my daily stop at the Quickette for the newspaper and the non-print news had for years been an important part of my routine. Gone, now, a victim of many things -- too much credit given to too many who never paid, cashflow crunches, shinier and larger competition across the street, changing times. It's too bad, and it's more than that -- Steve Meador ran a good store, gave back to the community -- money for sports teams and fundraisers when he had it, a big smile even when he didn't -- and I suspect that in many ways he gave more than he got. Now when I drive by the Quickette, what I get are memories. Good ones, and ones that I'll keep forever, but just memories nonetheless. A week last night since the last time we saw our pal Pumpkin, and while I continue to hope that he's indulging spring fever and will return, I'm having a hard time holding that hope close. A few months old, P-Man was due last week to be neutered, and the fact that he was intact gives me what little optimism I retain: maybe he has found a lady. But the woods and thickets at this farm and the surrounding ones are home to bigger cats, bobcats, and that's what I fear Pumpkin ran into last week. While there are coyotes in the county, as increasingly everywhere, I've not seen or heard any on our property or the adjacent ones. I haven't come across any evidence of a fight or struggle, nor have I seen any scavenger birds circling. Also, P-Man's brother Oreo's behavior changed noticeably last week -- he doesn't fare as far, nor does he stay out at night, as had been his, and their, habit. He keeps close to home now, and I can't help but wonder if the change has anything to do with Pumpkin and, perhaps, Pumpkin's fate. 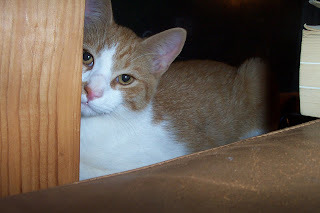 P-Man, our Pumpkin, was among the most affectionate animals I have ever known, and I do -- as best as I am able -- continue at least some of the time to hope that he comes home.